This is a picture of Dunkeld cathedral. 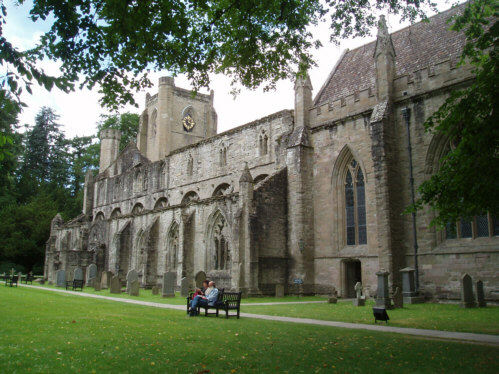 Dunkeld Cathedral lies on the north bank of the River Tay just to the west of the centre of Dunkeld. The site has been holy ground since about 730AD when Celtic missionaries, built the first monastery here. The "modern" Cathedral shows both Gothic and Norman influence having being built in stages over a period of nearly 250 years between 1260 and 1501. In addition in 1560 it suffered badly in the Reformation when anything considered to be remotely "Popish" was destroyed. However, worse was to come on 21 August 1689, during the first Jacobite uprising. The Jacobites, attacked Government forces based in Dunkeld and much of the town, including the repaired parts of the Cathedral, were burned down. As with all historical monuments and attractions the cathedral has many stories attached. The Cathedral is dedicated to St Columba and it is said that after their journey from Iona his relics were buried under the chancel steps to keep them safe.